It was our Holy Father himself who found this charming name for her. In Latin and in Italian both, Gemma means a gem; and with his rare spirit of intuition he called her with delight, speaking in Latin: "Gemma Christi," the Gem of Christ. Limpid gem, of purest water, transparent, yet blazing with the fire of blood. We have waited a long time--at least it seems a long time---for this day of her glorification, and those who know say that at times the combat has been stren­uous; but the day has dawned at last, the 14th of May in this year of the solemn remembrance of the Passion and Death of our Blessed Redeemer. We were told of the unspeakable joy of the Postulator, Father Egidius, C. P., when, at the reading of the decree for the heroicity of virtues, the Holy Father stated that the little virgin of Lucca had "borne in her flesh the Wounds of Christ." All day long, in his transcendent happiness, the Passionist Father who has fought so hard for the cause, went about asking radiantly of all he met: "Did you hear what the Holy Father said? He said with his own lips that she 'bore in her flesh the Wounds of Christ'! " . . .
Well, it was the morning of May 14, and one could not help feeling a certain emotion in approaching the basilica of St. Peter because crowds of people speak­ing every known tongue in this everlasting Pentecost of the Universe, Rome, were pressing toward it, and from the main balcony of the facade hung a great banner, covered still with green cloth, which would presently be removed and every eye would be able to see the new Beata, humbly kneeling in prayer and wafted heavenward upon a luminous cloud. But as yet the image was covered. The interior of the basilica presented a solemn and festive air. It was hung with crimson damask, and thousands of electric lights in grouped chandeliers illumined the immense arches of the apse. In the so­called "Glory of Bernini" above the altar, above the cathedra of St. Peter, and gar­landed about by a flight of golden angels, was another of those pictures covered with a gray-green cloth. That, too, was to be presently removed. 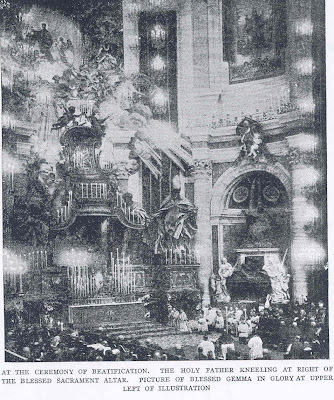 Even an hour before the time set for the ceremony of the Beatification the basilica was filling rap­idly, and it was evident that the keenest interest was felt regarding the person of the new Beata and the wonderful circum­stances of her life. Many have observed that it was strange the Beatification of Gemma Galgani should draw such enormous crowds, and that so much sympathy and reverence should be manifested for this humble girl, who, as the world rates it, did so little during her short life. But Christ Cruci­fied, being lifted up, draws all things to Him. And perhaps, beneath the over­whelming materialism, and worse, of the surface of society, there is a deep under­lying crave for better things, a thirst for the spiritual and the mystic. We could only note the extraordi­nary attraction so many seemed to feel for the little virgin of Lucca, and marvel at it. How shocking to her meekness and humility would the splendor of such a day be! But He Who loved her has prepared it, and she must needs submit. And all the more since it redounds to His glory and to the triumph of His Cross. How beautiful her face must be today in Heaven, if one could only see it l How radiant with light, how shining with the laughter of love! As we wait in that tense atmosphere, we note in the various tribunes groups of a high significance and interest. On the Gospel side of the apse the magnificent group of the Passionist Congregation. Gemma is in a special way theirs. They above all others have known her value; they have fought long, and hard, and against heavy odds to uphold her. And it strikes us that there is an extraordinary chivalry of knighthood about this noble group. They are all there, from the Father General to the Assistants, the Provincials and Superiors of houses, to the youngest priests and students. White heads, grey heads, dark heads; long lines and broad folds of black mantles; shields of white over the heart, knightly cognizance stamped with the monogram of the King. In the Name of the King they have fought for the maiden whom the King loved. And they have won. All honor to them. As chivalry implies service, they are serving; at the doors, on the steps of the tribunes, in the passages, everywhere. To my right is a young Passionist standing on duty, and when he is not in movement he looks like a statue of prayer, motionless, his hands clasped, his eyes fixed upon the altar. In the tribune to the left there is a student with the face of St. Gabriel, a rather transparent face, but gracious and smiling. Over across the apse, on the Epistle side, is another group of paramount interest. Those who know point out the different persons. Chief among them is Angela, the sister of Gemma. One fancies there must be a resemblance, the shape of the face, the purity of the outline. She is only just beginning to be elderly. Dressed in black but so simply, and with a scarf passed over her head. There is a natural refinement in her features, an expression of sweetness about the mouth. Curiously enough she seems perfectly at home in St. Peter's; alert and very much interested, but a plain body with no pretences. Then Signor Matteo Giannini, with a long flow­ing beard of white. Gemma lived in his household for many years, and it was his sister, now dead, she used to call Mam­mina, "Little Mother." Then the vener­able aged priest, an octogenarian, the pastor of Camigliano, who baptized the infant Gemma in his village church and gave her the name that is so precious now. Sister Giulia Sestini who taught the little girl for several years in the St. Zita School in Lucca, and various other persons who had known and cherished her. It was an astounding thing to realize that these people were all among us still and that their Gemma is a Saint in Paradise! At about ten o'clock, threading across the black mass of the crowd, and wending their way into the apse, comes the proces­sion of the Cardinals, headed by the mace­bearers, and escorted by masters-of-cere­monies and attendants. They take their seats on the upper benches. After them in order come the Archbishops and Bishops, and the Heads of Religious Orders in their various habits. Then the Vatican Seminary and the Canons of St. Peter's with the Archpriest of the basilica, Cardinal Pacelli. Father Egidius, C.P., the Postulator of the Cause, sits just below the Chapter, with the decree rolled in his hand, and he springs up with alacrity when the master of ­ceremonies bows before him. With him goes the Secretary of the Sacred Congregation of Rites, and the two together incline before the Cardinal Prefect of this Congregation, presenting to him the" Apostolic Brief" and begging him to order the publication of the same. The Cardinal Prefect invites them to request of the Cardinal Archpriest his permission to read the Brief in St. Peter's and, leave being granted, in the consecrated Latin formula, the Brief is handed to Monsignor Giuseppe Migone, who ascends to a small temporary pulpit and reads the long Latin Brief with great clearness and expression. In it the simple story of Gemma Galgani is set forth, with a mention of all the extraordinary graces she received from Heaven. Her virtues are praised, especially her profound humility, her angelic purity and her ardent charity. Three times her extraordinary devotion to the Blessed Eucharist is mentioned and, paramount love of her heart and soul, the Sacred Passion is described as impressed upon her, thorns on the brow, wounds in her hands and feet and side. Miracles have been obtained through her interces­sion, and for all these reasons, Pope Pius Xl happily reigning, declares that he inscribes her among the Blessed. Something, a thrill, a tremor, an electric current passes over the vast assembly, though there is no sound. 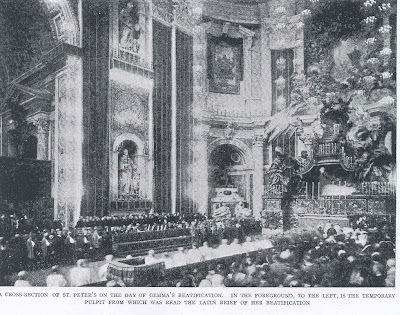 The reader concludes that this document is given in Rome, at St. Peter's, on May 14, 1933. There is the silence of a moment, a sort of gasp during which every head turns to the Glory and every eye gazes intently, then simultaneously the great reliquary upon the altar is uncovered, and the veil drops from the painted effigy of the Beata, while a vivid light flashes over it. There is a gust over us all as of cold air, and unex­pectedly, irrepressibly, a long patter of hand-clapping over the whole church. One might be shocked but it is so spontaneous, so unpremeditated, that it is like the out­bursting joy of children. It is difficult to take one's eyes from the Glory, for it is like a golden vision. In the pouring light, the modest, virginal form kneels upon the luminous clouds with arms outstretched. She wears the plain black dress, the little mantle which were her unvarying garb. During the singing of the Te Deum a group of young Passionists descend into the apse arid begin the liberal distribution of pictures and Lives of the Beata. Pre­lates receive a fine engraving tied with a purple' silk ribbon and gold fringe, and a bound volume of the biography. Then the messengers pass out into the tribunes giving freely, to all, a short account of the Life and an image of the Beata. They are still busily engaged when the High Mass begins at the altar of the Cathedra. The choir of St. Peter's, the Cappella Julia, render the music, and the Mass is the proper of Virgins with the special prayers of Blessed Gemma. The celebration is most solemn and impressive. When it is all over, we wander down into the main part of the basilica, and the crowd is such that though for twenty minutes the massed congregation has been pouring out through five doors, the nave is still packed. In fact, fresh swarms are pouring in, people who had no admission tickets but who can enter now. Men, women and children, many soldiers, poor lads stealing in to attend twelve o'clock Mass-they all move about, gazing won­deringly around them, and stand open­mouthed before the two great banners of the miracles suspended from the gigantic piers. These are the two miracles which were accepted as unquestionable for the beatification. Father Ulisse Fabrizi, a priest of Caprarola, was instantly cured of an inveterate and incurable ulcer on the leg when he inwardly implored the help of Gemma. Maria Menicucci of Vitorchiano who had suffered agonies for nineteen years from acute arthritis was suddenly and perfectly cured through the interces­sion of the little virgin of Lucca. The newcomers stand there gazing in wonder or looking up with devout affec­tion at the fair vision in the Glory. So we leave St. Peter's. It is high noon. For the afternoon ceremony it is esti­mated that about eighty thousand souls were present. The church was wholly filled, it overflowed, and that very rarely happens at St. Peter's even when the Holy Father is present. We flattered ourselves that having good tickets it would be suf­ficient to arrive an hour before the ap­pointed time, but we had an unpleasant surprise for the guards would not allow us to pass and the gates were closed. In vain we expostulated with the gendarmes and secret service men. They said the church was full and they had orders. Priests and pilgrims swarmed and stormed as we did but in vain. After ten minutes the iron gates were opened again and we all made a mad rush, a dash up the steps and inside the doors, but the crowd was suffocating, and the Palatine Guard drawn across the foot of the church would not suffer any person to cross their lines. to reach our seats. There was nothing for it but to stand in the crowd and wait. And perhaps the guards were right when they said that it was no use to push:-there was not a seat left vacant anywhere. From our place we could see the crimson cur­tains through which the Pope was to come and it was six of the evening, and several times the hangings moved but it was al­ways a false alarm. At last they were drawn fully back, the gendarmes closed the great doors behind us, and from the gal­lery over the main portal the silver trum pets flung down their sweet sharp rendering of the pontifical hymn. Tall undulous line of the Flaming Swords borne before the Pontiff, silver helmets of the Noble Guard, purple and scarlet of prelates, and on the high chair, carried shoulder high, the figure with, over the white cassock, a cape of crimson velvet, and a white skull-cap on the head. He passes blessing and moves out of our sight, but all along, as he goes, the ripple of hand­clapping and of cheers break forth in one continuous ovation. There is a prie-­dieu in front of the altar and His Holiness descends there and kneels down. He is kneeling before little Gemma Galgani! She was Gemma Galgani yesterday. To­day, mysteriously beautiful, transformed, a Saint, a Bride of Him Who Was crucified, one of His gems. The Blessed Sacrament is exposed and the choir sings the O’ Salu­taris Hostia. The Sovereign Pontiff offers the incense. The hymn of the Holy Virgins is sung, then the Tant-um Ergo, and the Archbishop of Lucca has the privilege of giving the Benediction. When the Holy Father resumes his seat, the customary gifts are offered to him in homage and they are again the Pas­sionist Fathers who have the honor and the joy of presenting these. A splendidly bound Life of Blessed Gemma, a magnificent bouquet of artificial flowers made by a cloistered community (we believe) and a handsome standing reliquary of chiselled silver adorned with the Sign of the Pas­sionists and surmounted by a statuette of the Beata. His Holiness is full of joy and congratulates the Fathers and also the Archbishop of Lucca. The Gem of Christ is theirs as well. Then the Pope is assisted to the Sedia Gestatoria and begins his return, from the apse down the nave. The slow, marked music of the silver trumpets accompanies his progress but half the time they can not be heard for the shouting and cheering of the people. If they were enthusiastic on his entrance, now they are beside them­selves. They seem to. want to show him their appreciation, to voice their thanks. Hands and arms raised,- waving of hand­kerchiefs, cries, shouts, hand-clapping. "Viva it Papa! Viva!" He is blessing slowly, continuously, to right to left, fre­quently bending forward, sometimes smiling. As he reaches the end of the nave, the crowd flings forward toward him cheering deliriously. He causes the chair to turn and stop so that he is face to the altar, and swiftly stands erect. It is so obviously done in recognition of their greeti'iigs, and that all may see him well, that a ctorm of applause breaks forth and the Vivas are deafening. The sound of the trumpets is completely swallowed up. Then he blesses once more and the chair passes out slowly under the crimson curtains. "Father, you used to be in Lucca. You must have known Gemma Galgani." It is a very old venerable priest. "I knew her well, for four years. Often she has kissed these hands. I was holding them up to her now, over there in church. 'You so often kissed them', I said to her. Be mindful of me now." On September 8th 1933, on the occasion of Gem­ma's Beatification, her mortal remains were carried shoulder-high to St. Martin's Cathedral for the festi­vities at the diocese. On October 2nd, 1933 the corpse re­turned to the silence of the Monastery-Sanctuary that is named after her. I AM REDUCED TO TEARS IN READING THIS ACCOUNT FOR HER BEATIFICATION. BLESSED BE YOU MY DEAR GEMMA. YOU WHO HAVE BROUGHT ME SO MUCH CLOSER TO OUR LORD. Thanks you for your kind comment. I am glad to hear that you enjoyed this article. The devotion of all the people to St Gemma is awesome, isn't it! St Gemma has inspired and touched the lives of so many people...St Gemma, pray for us! I went to Italy for the first time. Saw her picture above a door in Lucca where I knew nothing about who she was. But now i do thank you.